It takes two days to train a cow to milk itself. This may sound like a farmer’s utopia, but at Bakerview EcoDairy, a robotic milker is just one of many dairy farm innovations being put to use. Bakerview EcoDairy’s anaerobic digester stretches 60 feet long and converts methane gas from cow manure into electricity for use on the farm. Bill Vanderkooi, president and CEO of the Bakerview EcoDairy farm, seeks out all of the latest technologies to help him run his operation, which hosts an onsite market and agricultural education center. Armed with a master’s degree in animal science, Vanderkooi opened the 80-acre farm near Abbotsford, British Columbia, in June of 2010. He has since established himself as a pioneer among small-scale, sustainable farm owners. An anaerobic digester is one of the key technologies that Vanderkooi uses in his quest to reduce his farm’s ecological footprint. This machine turns the methane gas released from cow manure into electricity. About 65 percent of cow manure is composed of methane, making it an abundant energy resource. Over the course of a year, Bakerview EcoDairy is able to offset a third of the energy needed to operate the farm, thanks to the digester and a small herd of 50 cows. 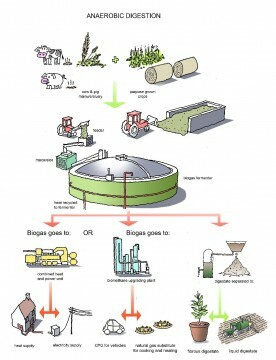 So, how does anaerobic digestion work? Image courtesy of Nethy Energy. Click to enlarge. 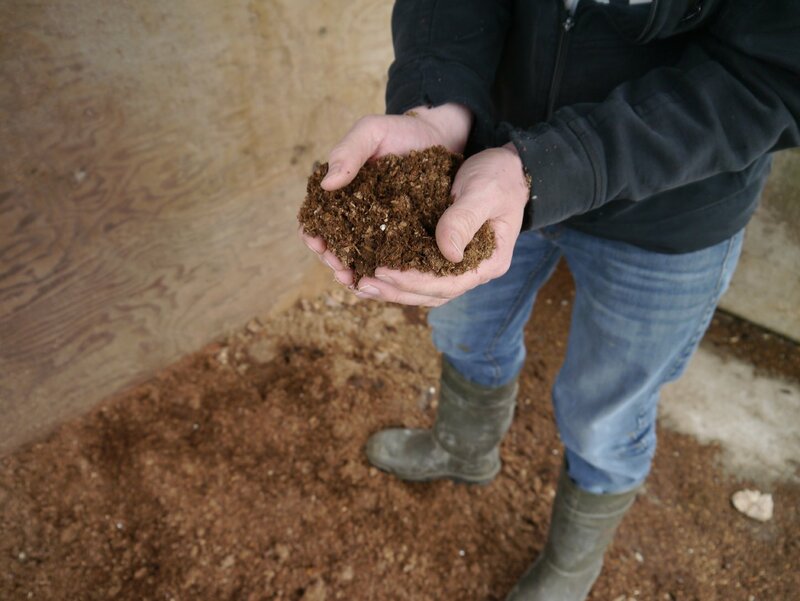 Before entering the digester, manure is heated to 100 degrees Fahrenheit, the perfect temperature to prime the appetite of picky microorganisms. Pistons push the hot manure into the main chamber where the microorganisms feast. The manure breaks down into a biogas bubble and a mixture of solids and liquids. The bubble, mostly methane gas, can be harnessed and used to fuel an engine and generate electricity. The whole process takes 21 days. The leftover solids and liquids are filtered and used for cow bedding and fertilizer. Methane is a powerful greenhouse gas. Its contribution to the greenhouse effect is over 20 times more potent than that of carbon dioxide. On a typical farm, cow manure is spread on fields where the methane gas seeps out of the manure and into the atmosphere. Digesters can help combat methane release by burning the gas and converting it to carbon dioxide. 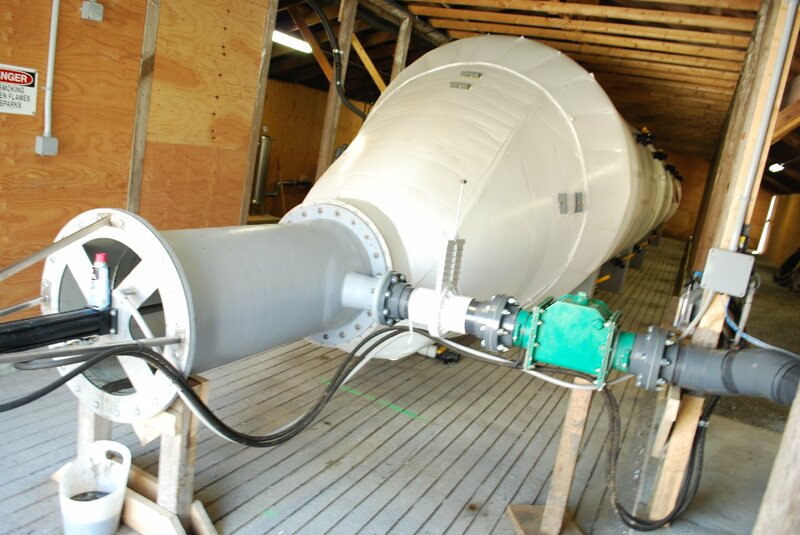 The digester captures the methane before it has a chance to escape into the atmosphere in its pure form.These digesters do more than generate a sustainable source of electricity for commercial farms. They also reduce greenhouse gas emissions. The digesting process creates an odorless, solid by-product. Bakerview EcoDairy uses this by-product for cow bedding. Besides generating electricity and reducing greenhouse gas emissions, the anaerobic digestion process eliminates nearly all cow manure odors. Many small farmers struggle to afford the new technology, but increased popularity and demand are helping make digesters more accessible. Soon more small farms like Bakerview EcoDairy should be able to take advantage of this technology. So interesting! Thanks for covering, Sarah.